The extremely compact and feather-weight DC 2122 is yet another digital camera from MINOX in which design and functionality have been optimally combined. Like all other MINOX digital cameras the DC 2122 is extremely convenient to use, also making it ideal for beginners entering the world of digital photography. This new model is easy to operate, even without previous knowledge, and guarantees unlimited photographic fun. Simple menu guidance and clear and precise symbols enable the user to quickly change between shooting the picture, reproduction and the storage function. After actuating the shutter the user can immediately view the shot in the large TFT display. The automatic white balance ensures optimal exposure, even in difficult light conditions, and provides the user with a natural color rendition and the correct setting of the picture motif every time. 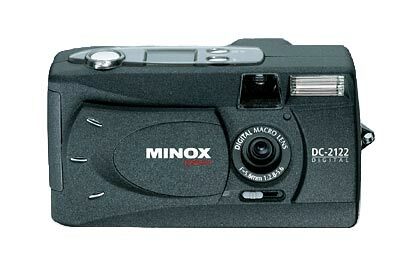 With its 2.1 megapixel (1/2.7 inch) CCD and the fast multicoated lens the MINOX DC 2122 offers everything a digital camera needs and guarantees the photographer unforgettable shots. Shot intervals <6 sec., image reproduction <6 sec.